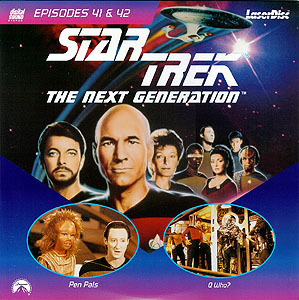 Star Trek: TNG - Pen Pals / Q Who? ©1989 Paramount Pictures. All rights reserved. Q Who? ©1989 Paramount Pictures. All rights reserved. Data (Brent Spiner) has found a pen pal - a girl named Sarjenka (Nikki Cox) who lives on the planet Drema Four. When Data tells Picard (Patrick Stewart) about Sarjenka, he learns that there have been severe geological disturbances beneath Drema Four's surface. Riker (Jonathan Frakes) puts Wesley (Wil Wheaton) in charge of the team to research the planet's geological makeup. 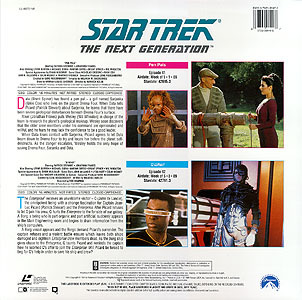 Wesley soon discovers that the older crew members under his command are opinionated and willful, and he fears he may lack the confidence to be a good leader. When Data loses contact with Sarjenka, Picard agrees to let Data beam down to Drema Four to try and locate her before the planet self-destructs. As the danger escalates, Wesley holds the only hope of saving Drema Four, Sarjenka and Data. The Enterprise receives an unwelcome visitor - Q (John de Lancie), the omnipotent being with a strange fascination for Captain Jean-Luc Picard (Patrick Stewart) and the Enterprise. After Picard refuses to let Q join the crew, Q hurls the Enterprise to the far side of our galaxy. A Borg, a being who is part organic and part artificial, suddenly appears in Main Engineering and begins to drain information from the ship's computers. A Borg vessel appears and the Borg demand Picard's surrender. The captain refuses and a violent battle ensues which leaves both ships damaged and eighteen Enterprise crew members dead. As the Borg ship gives chase to the Enterprise, Q taunts Picard and reminds the captain how he scorned Q's offer to join the Enterprise. Will Picard be forced to beg for Q's help in order to save his ship and crew?